There’s something strange lurking in the depths of the Sahara desert. 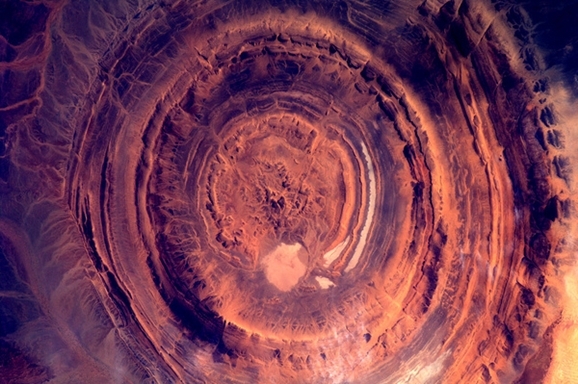 Dubbed the Richat structure (or the far-cooler nickname, “The Eye of the Sahara”), the circular structure is massive, with a diameter of 40 km. Since most of us will never get the chance to fly over the top of the sucker, check out this gorgeous shot of the Richat structure, photographed by Dutch astronaut Andre Kuipers from the ISS this past March. 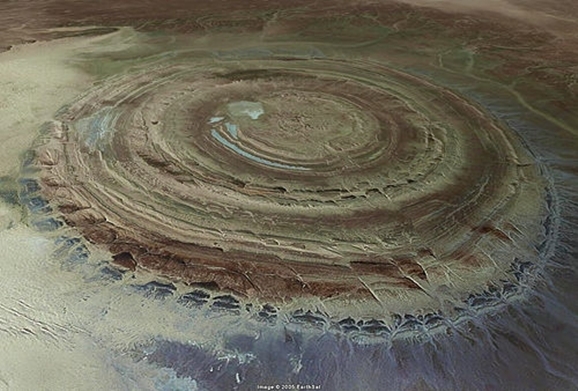 Now, I may not be a geologist, but I think I can definitively state that the Richat structure is totally concealing an ancient alien mothership, just waiting to be powered up. Watch the skies, people! Also, I will be selling tinfoil hats for very reasonable prices. Here’s another look at the Eye of the Sahara, via Google Earth. It’s the worlds biggest Geode, now mostly eroded away. It’s the remains of Iram of the Pillars – Damn you Nathan Drake! Ya ya, it’s all lolz until the day one does land on the white house lawn… just saying. Then Reynolds becomes a hat company. It’s the cap of Dante’s Inferno.